In a press release sent out today, Vue Technology announced Chris Conti to be their newest VP. You may already know Chris from his 20 years spent in the aquarium industry. As one of the founders, and a former President of IceCap Inc, Chris developed the popular 660 & 430 ballasts, and was involved with virtually every corporate function. Chris is going to be a valuable member of the CoralVue team, and we are sure he will play an integral role with their expanding operations. Congrats Chris! Before reading the official press release, don’t forget to check out Coral Vue’s new MoonVue Retrofit LED Tube. With the appearance of standard T5 tubes, these new highly efficient LED strips make corals absolutely pop! We have one of these tubes over one of our tanks, and when the Metal Halides go off, the reef is transformed by the blue 470mm LED’s. And best of all, there’s no wiring required! Here’s the official Press Release from CoralVue. Slidell, Louisiana- With a reputation for producing quality and innovative aquarium specialty products for close to a decade, Vue Technology is once again demonstrating its commitment to sales and customer support. Vue Technology has been focused on expanding operations positively from new product development and top notch customer service to increased personnel. To bolster those efforts, Vue Technology is proud to announce that industry veteran, Chris Conti has joined their Executive Team as Vice-President of Sales and Service. Chris is well known for his 20 years in the aquarium industry and a former President of IceCap Inc. As one of the original founders of IceCap, Chris developed the popular 660 & 430 ballasts and created the customer service standards that made IceCap into a leading lighting manufacturer in the aquarium industry. He has worked at almost every corporate function from, sales manager and product development to supply chain and customer service. Few people have the astonishing perspective of Chris on the handling of aquarium products from source to consumer. This unique breadth of real world know-how makes Chris an invaluable resource to retailers and consumers alike. Vue Technology is long known for making affordable products of the utmost quality and supported by superior customer service. With Chris Conti’s help, they will continue to be an industry leader in aquarium products while expanding service to a broader range of distribution, specifically with a keen focus on supporting distribution and retail. Vue Technology has been making revolutionary products for the last decade. Their lighting products are known for efficiency and reliability. 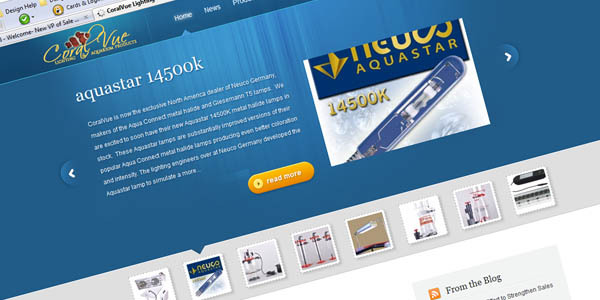 Offering more than just lighting solutions, they have extended their reach with a wide range of skimmers, pumps, reactors, refugiums and sump products for the aquarium industry and science. CoralVue’s product line has expanded vastly over the years and with a commitment to produce high quality products and services, they are expected to be around for years to come.